HIGHLANDS  July 28, 2015  Three incidents of copper theft earlier this year nearly ended the Highlands Little League teams season when it turned the lights off on their playing field, ahead of regular season and all-star games. Today, those young baseball players and their families had reason to celebrate after lawmakers tightened laws to curb copper theft, and the local community and AT&T* went to bat for the team to get the lights back on their field of dreams. 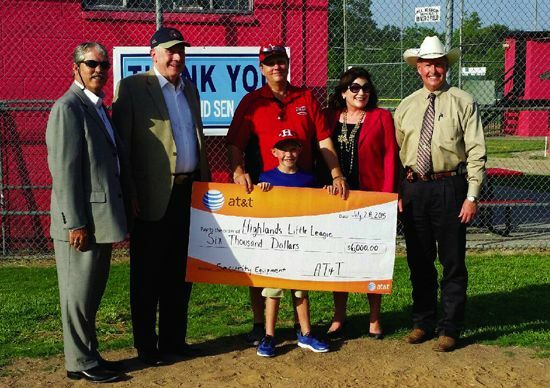 A check presented to the Highlands Little League by AT&T in a community celebration Tuesday night helped cover the remaining portion of their GoFundMe goal to raise $10,000the cost of replacing 2,500 feet of stolen copper wiring that was needed to get the lights back on and increase security at the thrice-targeted field. The Houston area copper theft incident also shines a light on how copper theft impacts everyonein cities across the statefrom Little Leagues and churches to large telecommunications and cable networks. In the most recent Texas Legislative session, lawmakers, led by Rep. Wayne Smith and Sen. Larry Taylor, took action to curb these rising thefts. Smith authored and Taylor sponsored the new law (House Bill 2187) which takes effect Sept. 1, 2015 and garnered the support of a broad coalition of businesses, law enforcement and community advocates. Houston is a hotbed for this type of criminal activity. According to the National Insurance Crime Bureau (NICB), Houston has ranked among the top ten metro areas with the highest number of metal theft claims in the US. The problem is not unique to Houston. Metal theft costs taxpayers across the United States more than $1 billion each year. Harris County Attorney Vince Ryans office won a $29.2 million lawsuit against the companies that polluted the San Jacinto River with toxic waste from a paper mill in the 1950s, and now the County Commissioners have voted to return some of that award to the area where the pollution has affected it most. $10 million of the Countys share will be spent on environmental improvements in the Highlands area, according to County Judge Ed Emmett. In addition, this week State Rep. Wayne Smith announced that the states share, approximately another $10 million, will be designated for improvements along the San Jacinto River, and administered by the Texas Parks and Wildlife Department. At a recent Highlands Rotary meeting, State Representative Wayne Smith told the group that working with State Rep. John Otto, chair of the Appropriations Committee and representing the Dayton area, he had managed to get the States share, approximately $10 million, designated for return to the Highlands area, and administered through the Texas Parks and Wildlife Department. Inquiries that the Star-Courier newspaper have made to the TDPW and to Precinct 2 of Harris County have indicated that to date, no definitive list of projects has been generated or decided upon to make use of this money. HIGHLANDS  The new Sheriff Ron Hickman, Gretchen Knowles of Precinct 2 Harris County Commissioner Jack Mormon Office, Precinct 3 Constable Ken Jones, the staff of Woodforest Bank in Highlands and a host of deputies and members of the Highlands-Lynchburg Chamber of Commerce turned out last Wednesday to dedicate a return of the Harris County Sheriffs Office Storefront. The storefront is inside the Woodforest Bank Building at 420 S. Main, it will also house the Harris County Joint Task Force. The HCJTF is a task force comprised of law enforcement in the vicinity working together to interdict serious area crime. Traci Dillard, President of the Highlands Chamber of Commerce in a special dedication oration attributed the storefronts return to Highlands to a conversation between Dickie Woods with the former commander of HCSO storefronts years ago. 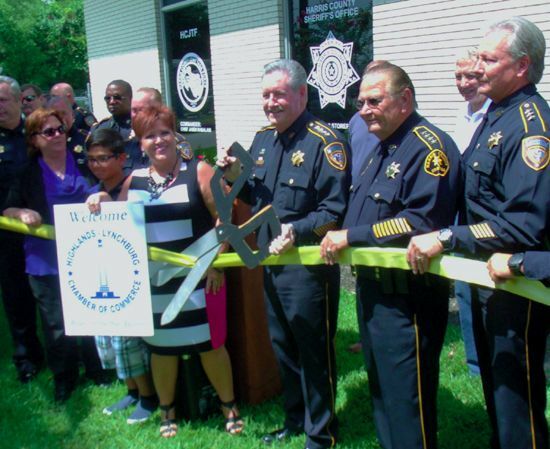 A ribbon cutting ceremony was performed by the Chamber with the Sheriff and Constable holding the ribbon at the scissors. The Highlands Storefront will serve as a community based outpost of the Harris County Sheriffs Office, serving the publics need in the surrounding area. Deputy Jesse Trey Valdez III was remembered with a special dedication Wednesday during the grand opening of the storefront. His mother and son attended the meeting and were recognized. Deputy Valdez was kiled in the line of duty on Wallisville Rd. when hit by an impaired driver in a head-on auto collision. A K-9 Deputy was purchased by the East Aldine District for the county, for $10,000 and bestowed with his name in honor of his service. The Highlands Storefront will operate Monday-Friday from 8:00 AM  4:00 PM. Members of the community can file criminal complaints, offense reports and seek law enforcement assistance from deputies assigned to staff storefronts in their communities. An array of law enforcement including the bulk of the K-9 Units and a variety of special task deputies were on hand with a variety of local business and service personnel.